How do I download .ogg files on this site? The preceding unsigned comment was added by NintendoFan369 (talk). I was playing on real hardware and broke a block with a shell that went off screen to the left. It broke a environment block of the middle of a big bush that was just appearing on the right side of the screen. Instead of the bush it was the sky/background. I saw the block explosion animation on the bush. I'm not going to add this to the main page because I've only encountered it once but since it was on real hardware I thought I should post this. If this is replicate-able add it to the main page. I was running towards the right as well. In the article of List of Super Mario bros.3 glitches there his an error, on the pipe bug, it claim it can only be done on the NES version, but it can be done in the all-stars version of Super Mario bros.3 as small Mario, take a look at my video, nothing as been temperd with, and no hacks where used, it his 100% legit. https://www.youtube.com/watch?v=CSt2Oh4yaQY .Does not work on the GBA version since you can't enter pipe while clip, and in the all-stars version if Mario times-up stuck in the pipe, it will only take him 2minutes and 30 seconds to come back down. Turn out the stuck in the pipe glitch can still be done a Super Mario, and fire Mario as well in the all-stars version, the only difference his, in the all-stars version if you get stuck in the pipe, fire Mario can shoot fire balls, but they will not appear on the screen, while in the Nes version the fire ball does appear on the screen, while stuck in the pipe. Hi, I have found one glitch that it's not on the list, how could appear in it? Has to be by a mod/admin? Thank you. 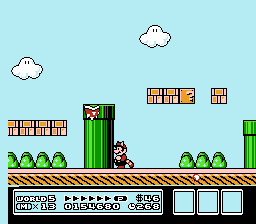 At the brick section of 5-tower, a brick block wall can be found, with a super leaf (p wing is easier) Mario/Luigi can go above the bricks, you can find a 1-up, if you decide to make a hole in the wall using the tail, and jump, you can hit some off screen bricks, this causes the broken pieces to appear from the bottom of the screen, as well as this, the exit pipe in the same area has bricks above it that Mario/Luigi can brake, making the pipe look like it's from a bad Super Mario Maker level. The preceding unsigned comment was added by Gold Yoshi (talk). Pipe seen not connected to anything. This page was last edited on March 17, 2019, at 15:55.